I am known to take photographs during a birth story. This amazing and life changing event is one to capture. I have worked with many local midwives at home like Christie with Blue Columbine Birth, Tiffany with Mountain Miracles Midwifery, and Jolene with Springs Midwifery and Women’s Care. I have also worked at all of the local hospitals and many OBGYN’s like Dr. York and Dr. Baer. I also have worked at Evans Army Hospital on Fort Carson. 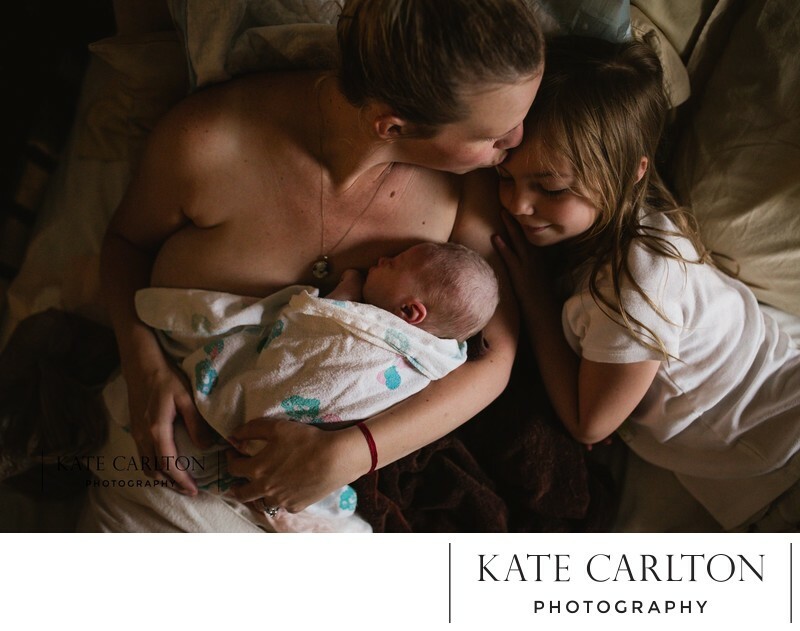 I work closely with the best doula team in town Springs Doula Circle, and they choose to partner with me after working with many others because of my presence in the birth space and their and my clients have said I am the best birth photographer in Colorado Springs. This mama, who is a doula, has three children and her third baby was caught in the birth tub by her first baby! Here they are all snuggling in that first golden hour of bliss after birth.